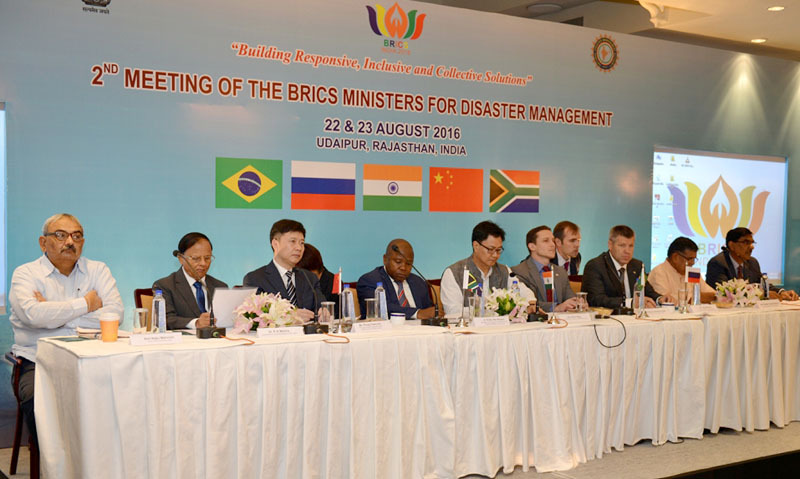 MoS (Home) Shri Kiren Rijiju inaugurates the BRICS meeting on Disaster Risk Reduction in Udaipur. 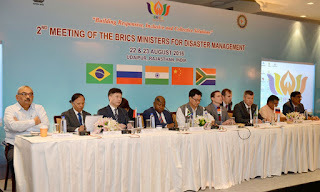 Calling upon BRICS (Brazil, Russia, India, China & South Africa) countries to collaborate for Disaster Risk Reduction (DRR), Minister of State for Home Affairs, Shri Kiren Rijiju said that it will, in turn, influence the global agenda for strengthening efforts on DRR and resilience. Inaugurating the two-day BRICS meeting on Disaster Management in Udaipur, Rajasthan today, Shri Rijiju said India was willing to stand shoulder to shoulder with other BRICS nations and explore all possible areas of collaboration. He added that DRR is a high priority area for the Prime Minister Shri Narendra Modi. Shri Rijiju emphasized that it is time that we move away from "a static understanding of risk", and that we must realise that "Tomorrow’s risk is being built today." He said that there is a strong need to focus on Urban disasters keeping in mind that by 2050, nearly two-third of the world population is expected to live in urban spaces. He said that we need to move towards an all-society approach to tackle disasters. While governments have to pay a central role, they cannot do it by themselves. They have to take everybody along. The Government action must be geared towards empowering and supporting communities and individuals to be more and more self-reliant in their quest for resilience. Earlier in his key address, Additional Principal Secretary to PM, Dr. P.K. Mishra, noted that all BRICS nations face common problems in terms of developing robust Early Warning Systems, involvement of communities and building their resilience and finding resources for rehabilitation and reconstruction. He added that it was essential to share success stories, case studies, innovations, low cost technology, joint exercises and mutual capacity building to reduce risk. He said that DRR is the back bone of Good Governance. The event has been organized by the Ministry of Home Affairs in collaboration with the National Disaster Management Authority. All the five BRICS countries are parties to the adoption of the Sendai Framework for DRR in March, 2015 and the Sustainable Development Goals (SDGs) in September 2015. A number of SDGs have specific targets related to Disaster Risk Management (DRM).